Sunshine and Smiles - by Cherryland Floral & Gifts in Traverse City MI - Cherryland Floral & Gifts, Inc.
Make their day brighter with an arrangement with a fresh garden feel. Arranged in a clear glass vase, your designer will select a wide variety of colorful flowers that evoke feelings of a garden walk. 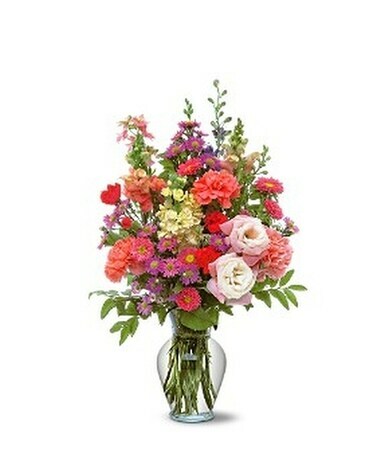 (flower varieties will vary with the season) Carnations, asters, larkspur and snapdragons arrive in a clear glass vase.